The largest city of the Canadian province of Québec, Montréal is both an alluring and idyllic destination for a honeymoon that can be as extravagant or economical as you wish. An easy flight from most cities in the United States, the city is located on an island smack dab in the Saint Lawrence River at the confluence of the Ottawa River. The city is named after Mt. Royal and continues to be the second largest French speaking city in the world (behind Paris) and it’s become a foodie haven, offering the most restaurants per capita in Canada. In June 2006, Montréal was officially designated a UNESCO City of Design, joining the UNESCO Creative Cities Network, so simply strolling through its beauty alongside your new spouse can be an adventure in and of itself. Hotel Le St-James is one of the most decadent spots to kick off your Montréal honeymoon. Situated in Old Montréal, it’s easy to get around to shop, dine and hit the hot spots, but you may not want to leave its impressive architecture. Hailing from 1870, it’s been completely restored to feature 60 luxurious guest rooms and suites. At XO Le Restaurant, considered one of the best in town, Chef Oleg Reznikov offers seasonal treats including an expansive menu and 24-hour room service. Be sure to make a reservation for Friday night when you can enjoy a first-class quartet during XO Jazz night. 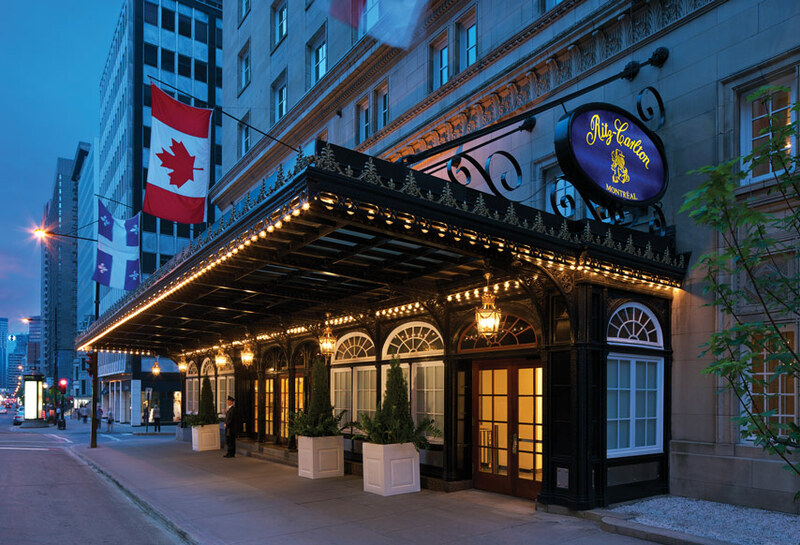 The Amore at Le St-James package includes welcome cocktails, a Swedish massage for two, room upgrades, breakfast, indoor valet parking and late checkout times. The Hotel Bonaventure Montréal is both urban oasis and Edenic Garden. The top two floors of the 17-story Place Bonaventure make the hotel feel like a resort. Book one of the five luxurious suites with sweeping city or garden views and don’t miss the outdoor heated pool. Honeymooners should take a close look at the Romantic Package, which includes a continental breakfast in bed featuring special selections from Menu Le Bonaventure, two bottles of sparkling wine, restaurant discounts, bathrobes and more. The Ritz-Carlton Montréal opened in 1912 and continues to set the bar for style and glamour in the “city of a hundred steeples.” Be sure to book spa treatments at the blissful Spa St. James where you can get the signature Ritz-Carlton Montréal massage with local maple balm to soothe the wedding-stressed soul. The spa caters to honeymooners, with options including a Couples Massage, Couples Customized Facial, Couples Aromatherapy, Couples Maple Sugar Massage and a decadent adventure: The Spa St. James Couples Experience. Make a reservation for Afternoon Tea for Two, served daily in the Palm Court from 12:30pm to 3:30pm with homemade canapes, scones and pastries. After tea move over to the Dom Pérignon Champagne Bar for a bit of bubbly. For something a more hearty (yet equally decadent) head to Maison Boulud from 3-Michelin star Chef Daniel Boulud where dishes are created in an open kitchen steeped in French culinary tradition with the emphasis on local Quebec products. And be sure to take a dip in the indoor rooftop saltwater pool. If you make it out of the hotel (we don’t judge!) head over to the Gay Village, where you can easily spot Rue Sainte-Catherine by its colorful decorations hanging over bustling restaurants, bars and more local fun. 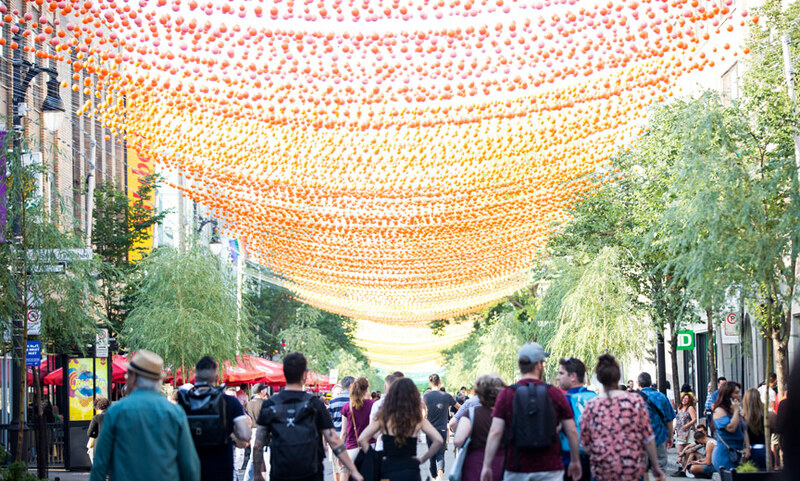 The Gay Village hosts a variety of public art exhibitions including the highly anticipated AIRES LIBRES, which runs from May to September between Saint-Hubert and Papineau Streets. Pop into restaurants like Bistro Cultural Pavilion, Da Giovanni, Flour and Fresh Water, Grill Torino, and The Blossom. Then party on at a bars like Bar L’Adonis, Complexe Sky, L’Aigle Noir, or Le Stud (for bears and their fans). Art lovers should definitely plan a stop at Montréal Museum of Fine Arts, where the collection includes some 43,000 works from Antiquity to today. Paintings, sculptures, photographs and other media are displayed in four different pavilions. The museum also includes a 460-seat concert hall with Tiffany stained glass windows and a new wing, the Michal and Renata Hornstein Pavilion for Peace which opened during the city’s 375th anniversary celebrations. For a bit of history, head to Old Montréal (Vieux-Montréal). Founded by French settlers in 1642 as Fort Ville-Marie, the greystone buildings and cobblestone roads will set an idyllic romantic scenario that’s perfect for Instagram or thank-you cards. Architecture lovers make a beeline to the impressive Notre-Dame Basilica. Museums in the area include Pointe-à-Callière, historic Chateau Ramezay and The Centre d’histoire de Montréal. Walking tour companies such as Guidatour Private Tours, Gray Line and Dyad Scooter Sightseeing can give you insights into the area. Guidatour also offers an Old Montréal Ghost Walking Tour, perfect for a unique storytelling experience. After exploring, head to the water at Bota Bota, a floating spa on a vintage ship stationed in the Old Port. Relax and enjoy the tranquility of the boat and gardens where you can indulge in a “Duo Californian massage,”a tasting platter for two and the lavender gardens sauna. Couples packages abound, and be sure to have a bite in Thomas Engasser’s inspired restaurant, La Traversée. Lastly, if you don’t make it up to the Observatorie Au Sommet Place Ville Marie in Montréal, you haven’t really finished your honeymoon. Planning a wedding? Connect with local LGBTQ-friendly wedding and event planners in our resources section.